“Thrall” is #21 on Amazon.com! 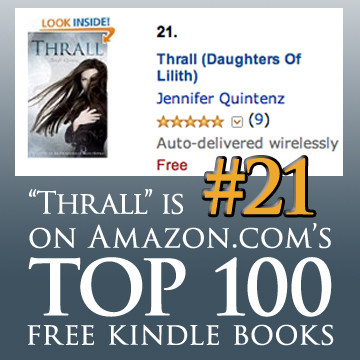 In the last 3 days, Thrall has climbed the rankings in Amazon and is now #21 on the Top 100 Free Kindle Books list! ‹ “Thrall” #28 on Amazon.com! Thank you so much! I’m really excited / amazed we did so well. Now we’ll see what happens after the free promo… 🙂 At least we got the word out to lots of people!